The procedure which enables controlled peeling and stimulation with acids applied onto skin surface is defined as “chemical peeling”. Dead layer of the skin is removed, circulation, cell production are induced and collagen tissue is revitalized. KWhat are the fields of use ? When is chemical peeling applied? How does chemical peeling provide benefit? How is chemical peeling applied? Epidermis is peeled with a chemical agent. Basal membrane is stimulated and upper layer of the skin is renewed. 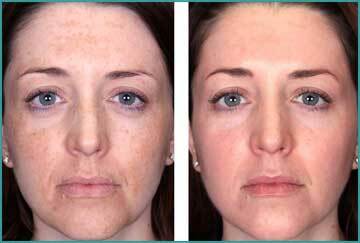 Photo-aging related epidermal and dermal damages are significantly reduced. The new skin is shinier, fresher and wrinkles have reduced. 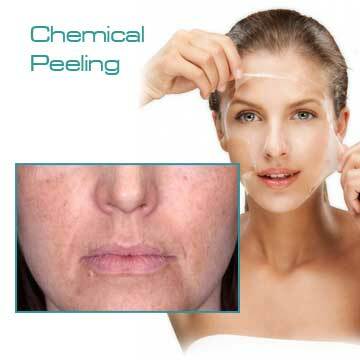 How many types of chemical peeling are available? Chemical peeling may be classified as superficial, intermediate and deep. Fruit acids used in superficial peeling clean dead cells which lead to a dull appearance and accelerate rejuvenation of healthy cells. Alpha-beta peelings are preferred for the patients who tend to acne development. Superficial peelings are applied as 6-8 sessions at every 2 weeks. Concentration and duration of stay on skin are increased at each session. TCA peeling is the most commonly used peeling and it should be known that redness and peeling may occur on days 3-7 after application. Deep peelings like phenol should not be used at outpatient setting due to cardiac risks. What are the depths of chemical peeling? What is superficial peeling? AHA, BHA, TCA (10-25%), Jessner solution. It leads to peeling at 0.06 depths. It is effective in superficial wrinkles, sunlight damage, spots and acne treatment. TCA (35-50) +/- another superficial peeling. It leads to peeling at 0.45 depths. It is effective in intermediate wrinkles, sunlight damage, spots, superficial skin cancer and pre-cancerous lesions. What is superficial peeling? How does it effect? What are the fields of use? The most commonly used chemicals for superficial peeling include alpha-hydroxy acids (glycolic acid, lactic acid, pyruvic acid), beta-hydroxy acid (salicylic acid), Jessner solution [resorcinol, salicylic acid and lactic acid in 95% ethanol (alcohol) ] and low concentration trichloro-acetic acid (TCA). All these products increase peeling. So cell rejuvenation is accelerated. Upper layer of the skin is peeled and skin becomes smooth. High concentration of alpha-hydroxy acids (35-90%) and eta hydroxyl acid (salicylic acid) (20-30%) are used for treatment. Acid solution is applied onto skin and waited for a couple of minutes, washed thereafter. This is repeated at every 1-4 weeks. It is used both for treatment of acne and acne scars. It is a quite useful method. 5-10% alpha-hdroxy acids and 2% beta-hydroxy acid (salicylic acid) cream, lotion and gel are available. They are used for adjuvant in acne treatment and post-peeling care. They are also used for fat control in fatty skin and for elimination of fat-related mild acne. These products rejuvenated skin through peeling, keep pores clean and thereby prevent acne. Beta hydroxy acid also alleviated inflammation. What are alpha hydroxyl acids (fruit acids)? How do they effect? What are fields of use? Alpha-hydroxy acids (AHA) are natural organic acids which are found in structure of some food. Glycolic acid is obtained from sugar cane, lactic acid from sour milk, citric acid, pyruvic acid and malic acid from various fruits, fitic acid from rice. Use of hydroxyl acids for skin care was first used at the time of Cleopatra. Cleopatra was reported to stay young through applying sour milk onto her face..
Peeling with AHA smooths and revitalizes skin. You may easily continue your daily life and work life after the procedure. AHA peelings may be used for elimination of fine lines, dryness, spots and acne..
AHA-containing solution is applied onto clean skin, waited for a couple of minutes and washed thereafter. This procedure does not take longer than 10 min. sun-protection cream is used after the procedure. Sessions may be applied at every 1-4 weeks. Mea 6-10 sessions are required. Use of retinoic acid or low concentration AHA creams and washing gels once or twice daily increases the effectiveness of treatment. AHA peeling may lead to redness, irritation and crusting. These side effects are temporal. Side effects are not common if the treatment method is selected according to skin type and structure. What is glycolic acid? How does it effect? What are the fields of use? Glycolic acid is the most commonly used AHA in offices of dermatologists and it is also known as lunch peeling. Because it may be applied during a lunch time and the patient may return work without signs of application. It is the most commonly used superficial chemical peelings due to ease of use. It is used both for treatment of acne and scars, and also wrinkles , skin rejuvenation. It was observed to increase collagen intensity and the quality of elastic fibers. Increasing collagen synthesis may be effective for delaying aging signs as collagen synthesis decreases with age. This effect may also accelerate the recovery of acne scars. What is lactic acid? How does it effect? What are the fields of use? Lactic acid is a popular AHA available in many home products and moisturizers. Hypotheses are available reporting that lactic acid belongs to natural moisturizer system of the skin. Lactic acid increases thickness, firmness and moisture of the skin. What is pyruvic acid? How does it effect? What are the fields of use? Peelings of pyruvic acid which are obtained from apple are found effective for treatment of acne. What is beta hydroxyl acid ( salicylic acid)? How does it effect? What are the fields of use? Beta- hydroxyl acid (BHA) which is also known as salicylic acid is a commonly used chemical peeling. It is preferred in 20-30% concentrations. These peelings reduce brown spots, superficial wrinkles and fine lines. Salicylic acid increases peeling and rejuvenation of skin as AHAs. Differently from AHA, it has anti-inflammatory effect. Salicylic acid leads to less irritation. It is combined with acne treatment in patients with acne and rosacea. It rapidly reduces comedo and red papules due to anti-inflammatory effect. Salicylic acid is different from AHAs due to being lipo-soluble. AHAs are water-soluble and do not show comedolytic effect. Salicylic acid shows a better comedolytic effect due to being lipo-soluble. Salicylic acid should not be used in subjects who are pregnant, lactating or who have salicylic acid allergy. Salicylic acid is available in many home care products. On- the- counter salicylic acid creams usually contain 2% salicylic acid. They are labeled as effective products in acne treatment. These products should be used in subjects who are pregnant, lactating or who have salicylic acid allergy. What is Jessner solution? How does it effect? What are the fields of use? It was first formulated by Dr. max Jessner. The solution contains resorcinol, salicylic acid and lactic acid in 95% ethanol (alcohol). Degree of peeling varies depending on its being used together with the other chemical peeling agents and layer of application. Jessner solution is not needed to be washed after application. It may be used in combination with other peelings. TCA may be applied and intermediate peeling may be done after Jessner solution in order to increase the depth of peeling. Jessner solution is quite safe. However care should be paid in dark skin type. It may lead to brown spots. Allergic reaction as long standing redness and edema may also develop due to resorsinol. Allergic reaction may be treated with steroid creams. What is intermediate and deep peeling? What are the fields of use of intermediate and deep peeling TCA? TCA may be used in 20-50% concentration. It is mostly used for intermediate peeling. TCA is carefully applied onto skin after the skin is cleaned. A severe burn may be felt at the beginning. This sensation may be alleviated with a ventilator. Whole face peeling does not take no longer than 15 min. two or more sessions of TCA peeling may be applied. Several months should be between sessions. However mild TCA peeling may be applied monthly. Sun protection cream is used after treatment. What is phenol? What are the fields of use? Phenol is the most potent chemical solution. It is used for treatment of deep wrinkles, spots, scars and precancerous lesions. Phenol is used on face. It may lead to scars in neck and the other body parts. It may lead to discoloration in dark skin subjects and it may cause cardiac rhythm problems. Whole face phenol application takes 1 or 2 hours. However it takes 10-15 min if applied on small areas. A single session is sufficient. Vaseline or treatment covers are put on treatment area. What should be done before and after the application? A mild and temporal burn sensation may be felt during and after the procedure however the patient may return to normal activity. You must protect the application area for sun exposure, avoid from solarium, use high factor protection creams. You should consult your doctor about the medications you are using or planning to use. Skin should be protected very well after the procedure. You must use sun protection creams even in winter. Care is needed before peeling. Open wounds or acnes should not be present on the skin. If present, peeling should be postponed. Likelihood of spots should not be neglected in dark skin, sun exposure should certainly be avoided after peeling and a strong sun protection cream should be used. How should skin care be after peeling? Crusts should not be removed, scar may develop. Mild moisturizers should be used after superficial peeling and intensive moisturizers should be sed after deep peeling. Sun protection should be done. Min 30 factor creams should be used. Retinoic acid, AHA or hydroquinone may be used at night after redness and sensitivity regress. What are the contra-indications for chemical peeling? When should chemical peeling be performed with caution? What are the side effects of chemical peeling? Likelihood of side effects is very low if applied by an expert physician. Infection may develop, mainly after deep peeling, antibiotic may be required. Severe herpes may develop or herpes may spread after peeling. Effective anti-herpetic drugs should be used before and after peeling. Removing crusts after infection or peeling may lead to scars.